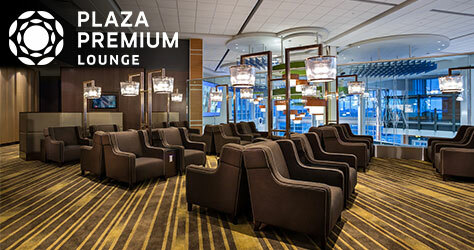 ESCAPE the airport crowds and enjoy first class comfort at the Plaza Premium Lounge! ENJOY comfortable seating, hot food buffet, self-serve bar, showers, magazines, TV, and WIFI for up to 3 hours prior to your flight. SAVE by pre-purchasing access to the Plaza Premium Lounge prior to travelling with Sunwing. With Sunwing Vacations, lounge access is available - starting at $40 per person plus taxes for up to 3 hours use (applicable taxes are as follows: 13% for Toronto or 5% for Vancouver, Edmonton & Winnipeg). Walk-in rate is $50 per person plus taxes for 2 hours; $60 per person plus taxes for 3 hours; or $80 per person plus taxes for 6 hours. Domestic departures: | Located conveniently after security, between Gate B22 and B24 in Terminal 3.
International departures: | Located across from Gate C32 in Terminal 3.